You're right. Nobody ever has too many homemade doughnuts just sitting around waiting to be made into doughnut bread pudding. Nor would I ever dream of recommending that anyone make doughnuts just for turning into bread pudding. 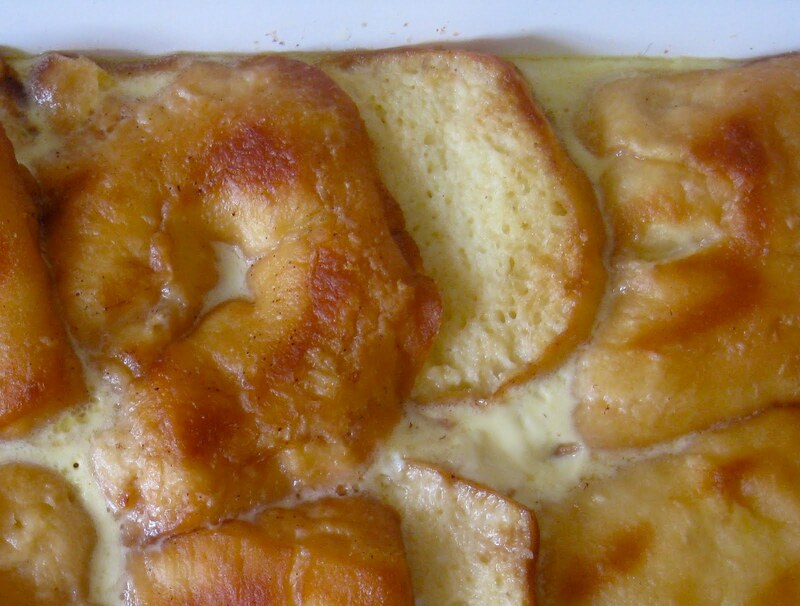 But should the unthinkable occur, consider that doughnut bread pudding is nothing other than a good rich dough, fried in lard, glazed, and baked in a custard; i.e., sublime. For my cookbook release party on Thursday, Mama and I made eighty-odd doughnuts according to the directions for overnight-risen potato doughnuts in the book. Half we glazed with the standard glaze, and half with the maple glaze (this time I browned the butter in the maple glaze recipe, a charming variation). We only brought a dozen back home, and those quickly dwindled to half a dozen. But after a day or two, the unthinkable happened: the doughnuts ceased to be perfect. And a doughnut that is anything less than perfect really has no reason to exist. So I made bread pudding. Preheat the oven to 350 degrees. 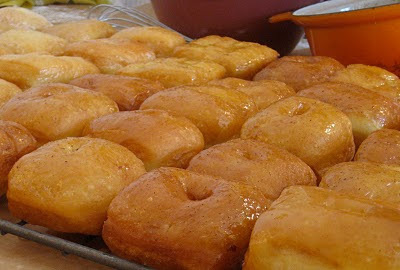 Slice six or seven stale homemade doughnuts in half like bagels and place them on a rack. Put them in the oven until they're lightly toasted, flipping them if need be. Meanwhile, beat 5-6 eggs in a large bowl. Add a teaspoon of vanilla, half a teaspoon of salt, a grating of nutmeg, a few tablespoons of maple syrup (inversely proportional to the amount of glaze on the doughnuts), and a quart of rich milk. Beat well. Pull the toasted doughnuts from the oven and let them cool. Butter a 9 x 13" baking dish. Find a slightly larger roasting pan to use as a water bath, and bring a kettleful of water to a boil. 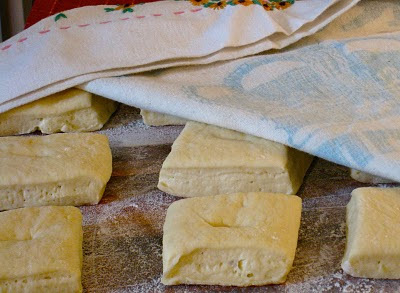 Arrange the doughnut halves in the buttered baking dish and pour the egg mixture overtop. Let the doughnuts soak in the custard for 15 minutes or so, turning them to sop it up on all sides. When they are nicely soggy, cover the dish with tinfoil and place it in the larger roasting pan in the oven. Pour hot water in the roasting pan about an inch deep. 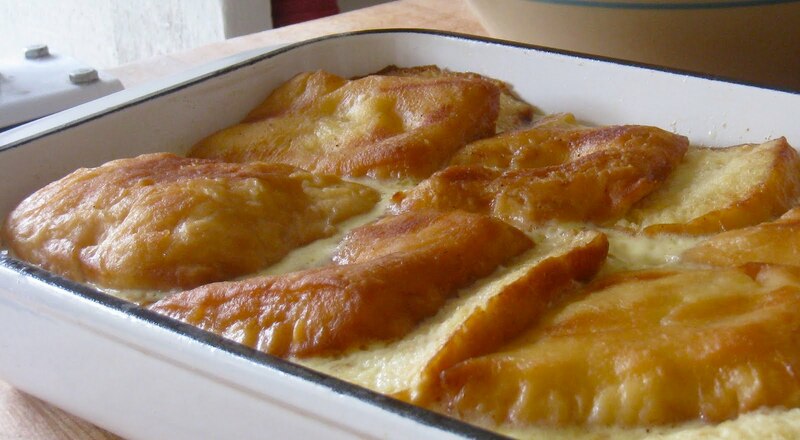 Bake 45-50 minutes, until the custard is mostly set, but still a bit runny in the middle. Let cool for half an hour and serve warm or refrigerate. I have your book and have made the Ghee. I'll start with the easier bits and work up to the more challenging ones. Your book is both a great read and an inspiring guide. Thanks!